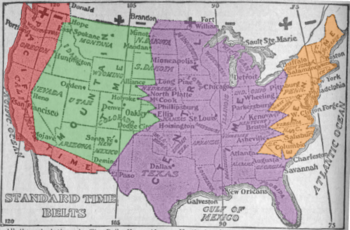 2.1 Zones used in the contiguous U.S.
2.2 Zones used in states beyond the contiguous U.S.
Before the adoption of four standard time zones for the continental United States, many towns and cities set their clocks to noon when the sun passed their local meridian, pre-corrected for the equation of time on the date of observation, to form local mean solar time. Noon occurred at different times but time differences between distant locations were barely noticeable prior to the 19th century because of long travel times and the lack of long-distance instant communications prior to the development of the telegraph. In 1960, the International Radio Consultative Committee formalized the concept of Coordinated Universal Time (UTC), which became the new international civil time standard. UTC is, within about 1 second, mean solar time at 0°. UTC does not observe daylight saving time. For most purposes, UTC is considered interchangeable with GMT, but GMT is no longer precisely defined by the scientific community. UTC is one of several closely related successors to GMT. Standard time zones in the United States are currently defined at the federal level by law 15 USC §260. The federal law also establishes the transition dates and times at which daylight saving time occurs, if observed. It is ultimately the authority of the Secretary of Transportation, in coordination with the states, to determine which regions will observe which of the standard time zones and if they will observe daylight saving time. As of August 9, 2007, the standard time zones are defined in terms of hourly offsets from UTC. Prior to this they were based upon the mean solar time at several meridians 15° apart west of Greenwich ( GMT). Only the full-time zone names listed below are official; abbreviations are by common use conventions, and duplicated elsewhere in the world for different time zones. View the standard time zone boundaries here. Eastern Time Zone (Zone R), which comprises roughly the states on the Atlantic coast and the eastern two thirds of the Ohio Valley. Central Time Zone (Zone S), which comprises roughly the Gulf Coast, Mississippi Valley, and most of the Great Plains. Mountain Time Zone (Zone T), which comprises roughly the states and portions of states that include the Rocky Mountains and the western quarter of the Great Plains. Pacific Time Zone (Zone U), which comprises roughly the states on the Pacific coast, plus Nevada and the Idaho panhandle. Zones used in states beyond the contiguous U.S.
Alaska Time Zone ( UTC−09:00; Zone V), which comprises most of the state of Alaska. Hawaii-Aleutian Time Zone (no daylight saving in Hawaii, UTC−10:00; zone W), which includes Hawaii and most of the length of the Aleutian Islands chain (west of 169°30′W). Samoa Time Zone ( UTC−11:00; Zone X), which comprises American Samoa. Chamorro Time Zone ( UTC+10:00; Zone K), which comprises Guam and the Northern Mariana Islands. Atlantic Time Zone ( UTC−04:00; Zone Q), which comprises Puerto Rico and the US Virgin Islands. Some United States Minor Outlying Islands are outside the time zones defined by 15 U.S.C. §260 and exist in waters defined by Nautical time. In practice, military crews may simply use Zulu time ( UTC±00:00) when on these islands. Baker Island and Howland Island are in UTC−12, while Wake Island is in UTC+12:00. Because they exist on opposite sides of the International Date Line, it can, for example, be noon Thursday on Baker and Howland islands while simultaneously being noon Friday on Wake Island. Other outlying islands include Jarvis Island, Midway Atoll, Palmyra Atoll, and Kingman Reef ( UTC−11:00); Johnston Atoll ( UTC−10:00); and Navassa Island, Bajo Nuevo Bank, and Serranilla Bank ( UTC−05:00). In Antarctica, the US research facility Palmer Station is in UTC−03:00, while McMurdo Station and Amundsen–Scott South Pole Station use UTC+12:00 in order to coordinate with their main supply base in New Zealand. Time in Indiana: red and pink areas belong to the Central Time Zone. divides Kentucky in half roughly along a line that is west of Louisville, Kentucky running from northwest to southeast. divides the region legally defined as East Tennessee, except for four counties adjoining Middle Tennessee, from the rest of Tennessee. follows the border between Alabama (west) and Georgia (east), although Phenix City, Alabama and some nearby towns unofficially observe Eastern Time. divides the Florida Panhandle along the Apalachicola River and Intracoastal Waterway just west of Tallahassee, Florida. follows the Salmon River west to the town of Riggins, where the Salmon River turns north. This puts almost all of northern Idaho in the Pacific time zone, except for the small loop described next. turns north and follows the Salmon River to the Snake River at the Oregon border (at 45°51.3′N 116°47.5′W﻿ / ﻿45.8550°N 116.7917°W﻿ / 45.8550; -116.7917). This loop to the north creates a curious situation where one can enter a more-westerly time zone by traveling east over one of the bridges across this portion of the Salmon River. turns east and follows the border between Idaho (north) and Nevada (south) along the 42nd parallel north to longitude 114.041726 W.
turns south and follows the border between Nevada (west) and Utah (east), except for following the west city limit line of West Wendover dividing it from the rest of Nevada, and putting it in the Mountain Time Zone. Jackpot, Nevada, just south of the 42nd parallel and some 25 miles (40 km) west of the time zone south turn, also observes Mountain Time, on an unofficial basis. follows the border between California (west) and Arizona (east), mostly defined by the Colorado River, to the border between the U.S. and Mexico. Daylight saving time (DST) begins on the second Sunday of March and ends on the first Sunday of November. 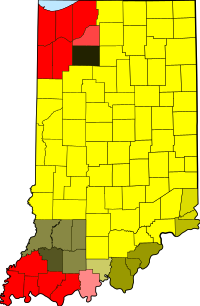 The portions of Indiana that were on Central Time observed daylight saving time. Also, some Indiana counties near Cincinnati and Louisville were on Eastern Time (ET), but did (unofficially) observe DST. The Energy Policy Act of 2005 extended daylight saving time (DST) for an additional month beginning in 2007. ^ a b c "Why Do We Have Time Zones?". ^ Debus, Allen G. (1968). World Who's Who in Science: A Biographical Dictionary of Notable Scientists from Antiquity to the Present (1st ed.). Chicago, IL: A. N. Marquis Company. p. 2. ISBN 0-8379-1001-3. ^ "Greenwich Mean Time (GMT) - time, facts, history". greenwichmeantime.com. Retrieved April 18, 2019. ^ Bernard Guinot, "Solar time, legal time, time in use" Metrologica, August 2011 (volume 48, issue 4), pages 181–185. ^ "15 U.S. Code Subchapter IX - STANDARD TIME".